I'm going to try to keep my thoughts to this episode, but I won't promise that I'll succeed. Somewhere between episodes 10 and 11 Michiko made a pretty big decision. Okay, she made a huge decision -- and we only get to see the result, not the thought process -- this is annoying, but I can live with it, if I have to (and, by the by, we know she found something in the paperwork that her predecessor left of interest to the current goings-on, but we're not told what, this also is annoying). 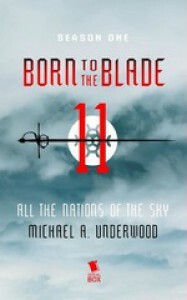 Part of the story-telling style that <b>Born to the Blade</b> is employing leaves us open to this kind of thing, so it's to be expected -- I'm just not crazy about it. Still, while I'm excited for what this means for Michiko, her nation, and the narrative opportunities for Season 2, I do regret what it means for some of the character interaction I've been enjoying all along. That's all I'll say about that now. Also, I couldn't help but feel that some of the progress made between Kris and Adechike last week has been walked back a bit -- some of which I understand, most of which I want explained before I can get on board wholly. But I don't see that happening. Still, I liked (both as a fan and as someone who's trying to look at the series through an armchair-critical eye) what both Adechike and Kris did throughout this episode. We got a long-awaited duel in this episode (like last episode), it didn't end the way my fan-boy impulses wanted it to, but did end the way it needed to. It's the kind of thing I think I expected the series to be built on -- and if a certain little war hadn't happened, probably would have. Every jot and tittle about Ojo in this episode was perfect, and I wouldn't change a thing. I can't say any more, but this was spot-on. I'm not sure what else to say at this point without venturing into spoiler territory, so I guess I'll wrap it up. Now, it's easy -- very easy -- to forget about one nation of the seven -- Tsukisen, and their warder, Hii no Taro. Yes, it's explained a few times -- but anytime Tsukisen is mentioned, it only seems to underline how often they aren't. This can be improved -- Underwood had a great opportunity here to fix that, and he passed. Which is okay, he's not the only one who had the opportunity, and I can only assume that this means that there's a plan behind it. I do hope that's rectified quickly in Season 2. And this point probably belongs more to the season-long wrap up post I'm trying to do, but I wanted to get it down before I forgot. This has been dubbed as "Season 1" since the beginning, so we knew everything wasn't going to wrap up nicely. In fact, there's <i>a lot</i> that's left hanging. But we got enough resolution to leave readers satisfied with where things left off. I do hope that Serial Box gives this team another shot to tell their story because I'm very curious about a few things and characters. But for now, we're left with an optimistic, but not a rose-colored glasses, ending -- true to the vision of the initial episodes, but with a darker undercurrent than one might have guessed from the first couple of installments. I'm not wholly sold on everything that happened this season, but I've come to accept and appreciate 96% of it -- and I will probably come around on the rest eventually. A good story, a good cap to the season and a good launching point for a potential Season 2. I'm just going to stop before I say "good" again -- pick up season 1 now, if you haven't yet.